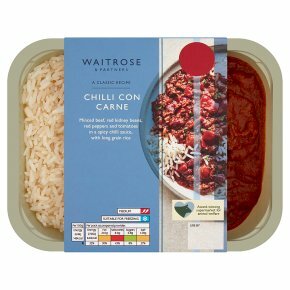 Beef simmered with kidney beans, green, red and jalapeno peppers in a spicy tomato sauce, served with rice. INGREDIENTS: cooked rice (water, long grain rice), beef (21%), tomatoes, red pepper, red kidney beans (6%), onion, water, tomato purée, rapeseed oil, garlic purée, jalapeño pepper, cornflour, ground cumin, salt, smoked paprika, lemon juice, sugar, beef extract, coriander, chilli powder, ground bay, oregano, paprika extract, ground cloves, yeast extract. For best results microwave.. Stir before serving.. Do not reheat once cooled. For best results microwave. Stir before serving. Do not reheat once cooled.